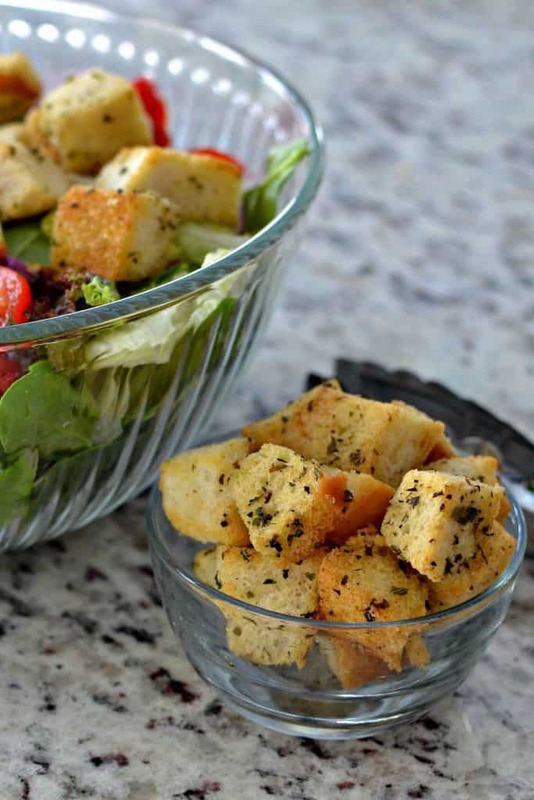 Homemade croutons make your salads and soups a taste tantalizing experience. Once you taste these you will never go back to those store bought croutons again. These beauties are amazing on Italian Chopped Salad with Fresh Italian Dressing and Spinach Salad with Warm Honey Mustard Vinaigrette Make a double batch and freeze them for later use. What kind of bread is best for Homemade Croutons. My personal favorite is a big fat loaf of Italian bread because there is far more bread than crust. French bread is a close second and of course any baguette will work as well. Use a good sharp knife for uniform croutons. For rustic croutons just pull rough pieces of bread from the loaf. Does the bread need to be stale for Homemade Croutons. Absolutely not. You can use fresh bread but you will need to cook it a little longer to brown and get it crunchy all the way through. When you check on the croutons simply pull one out, let it cool just a bit and then taste test it to see if it is crunchy all the way through. That being said don’t throw out that stale baguette. 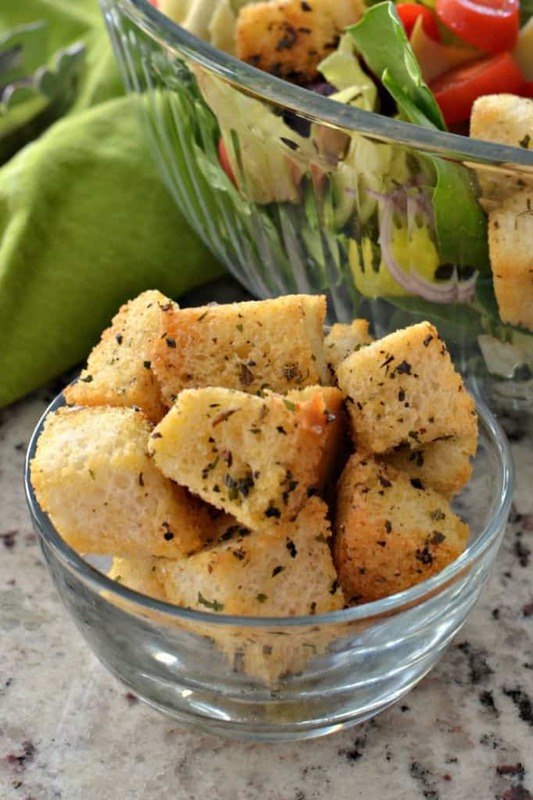 It is perfect for croutons and will crunch up quickly in your oven. Cubing it will be easier than a fresh loaf as it will not crush under a knife. 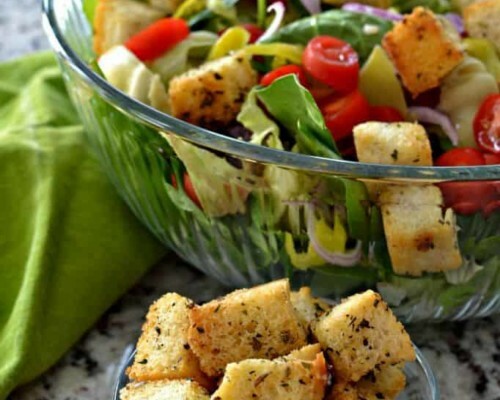 How to make Homemade Croutons. You will not believe how easy this is. First using a sharp knife remove the crusts from your bread. Then cut or tear your bread into bite size croutons. Then combine your olive oil, dried parsley, dried oregano, dried basil, garlic powder, onion powder, salt and pepper in a large bowl. Add the bread croutons to the bowl and stir gently to coat. I find it easier to do it with my hand. Bake until lightly browned and crunchy. Turn the croutons halfway through the baking process. If using fresh bread it will take several more minutes to get crunchy. Best way to tell if they are ready is to taste test. They should be crunchy all the way through. 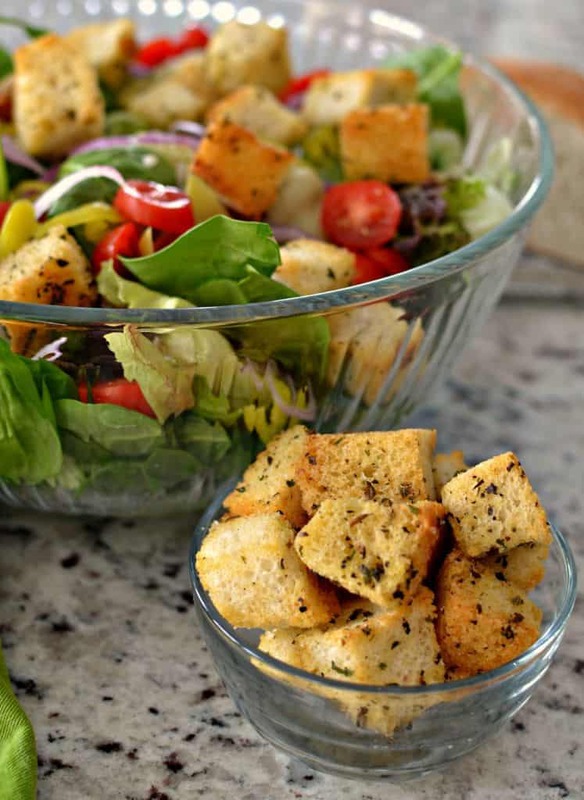 Helpful hints on making these the Best Homemade Croutons ever. Use good quality bakery style bread. It really does make a difference. If desired leave the crusts on the bread. Use cold pressed extra virgin olive oil. Melted real dairy butter may be substituted. If you don’t like one of spice ingredients listed eliminate it. Make sure you preheat your oven and load the croutons in the middle of the oven if at all possible. Use a silicone baking mat or parchment paper under the croutons on the cookie sheet. Do not overcrowd the baking sheet with the croutons. The heat needs to be able to move around the bread to dry it out and make it crunchy. Turn the croutons halfway through the baking process. For a change add 1/4 cup freshly grated Parmesan cheese. If you like things with a little kick add 1/8 teaspoon ground cayenne pepper. Other bread and roll recipes you will love! Using a sharp knife remove the crusts from the loaf. Then cut or tear your bread into bite size croutons. In a large bowl whisk together olive oil, dried parsley, dried oregano, dried basil, garlic powder, onion powder, salt and pepper in a large bowl. Add the bread cubes to the bowl and stir gently to coat. Place on a baking sheet covered with a silicone mat or parchment paper. Bake for 12-20 minutes; or until lightly browned and crunchy. Cooking times will vary depending on the size of the cubes and position in the oven. Turn the croutons halfway through the baking process. If using fresh bread it will take several more minutes to get crunchy. Best way to tell if they are ready is to taste test. They should be crunchy all the way through. 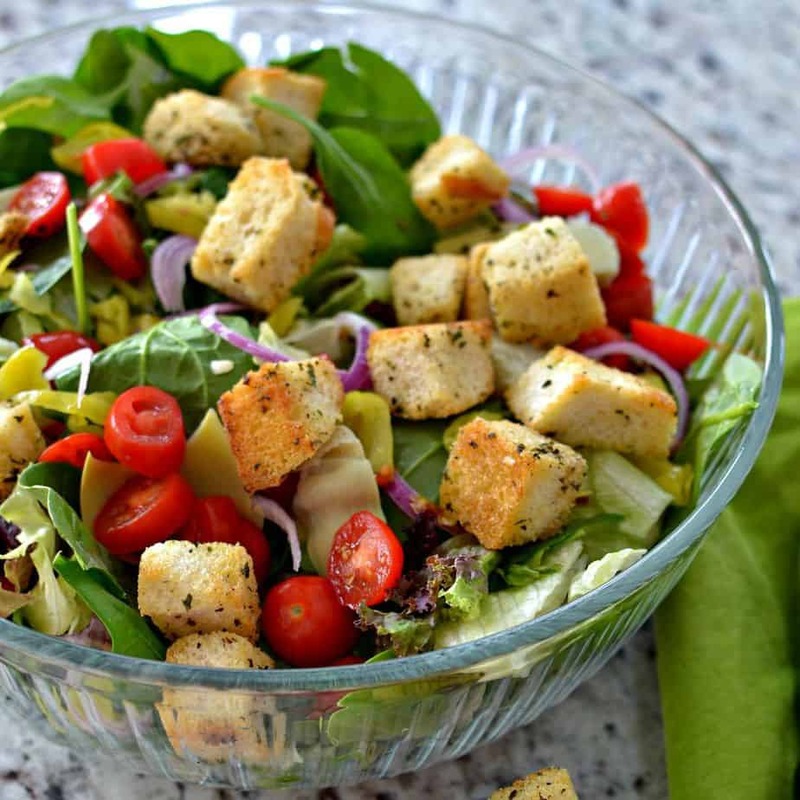 Croutons are the best part of a salad!! Pinning!